And so now we kick it off with exclusive Patron content. As I mentioned in the intro, my general approach is that all video recipes are exclusive to Patrons forever. When I have only photos (and I have a backlog of hundreds of recipes with photos only), those will be early access for Patrons for two weeks, then become public. Exclusive content for Patrons will be more than 50% of all content published. 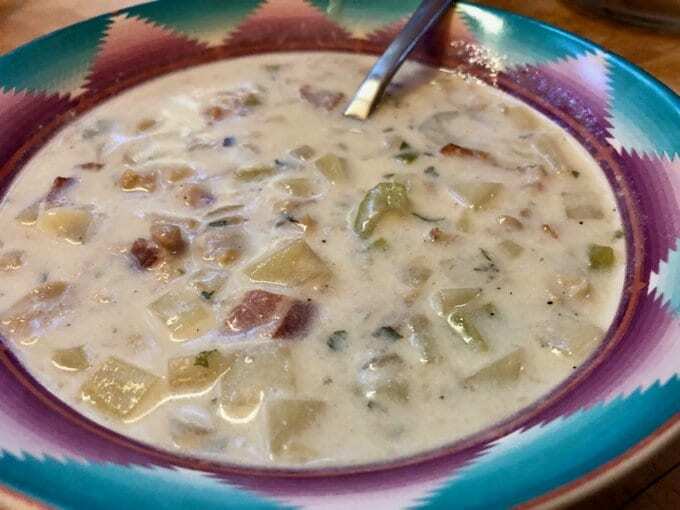 When you see “Famous Clam Chowder” touted by an establishment, do you often find that it’s clam flavored potato soup, wallpaper paste, or both? This has been too often my experience and so I’m showing you how to make it “just right,” Goldilocks. This is a rather low-fat version of New England Clam Chowder. Click the link for the rest, the preparation and video. I was someone’s guest last month at Red Lobster and had some clam chowder. Campbell’s is better. By a lot. Double that if you use some cream for water.